This calculator will calculate the rate and expense amount for personal or real property for a given year. The calculation is based on the Modified Accelerated Cost Recovery method as described in Chapter 4 of IRS Publication 946 - How To Depreciate Property. Plus, the calculator also gives you the option to include a year-by-year depreciation schedule in the results -- along with a button to open the schedule in a printer friendly window. Note that if you would like an answer to "What is Depreciation? ", or you would like to learn about and/or calculate straight line depreciation, please visit the SLD Calculator. Or if you would like to learn about and/or calculate Double Declining Balance depreciation, please visit the DDB Calculator. How to calculate MACRS depreciation. Calculate MACRS depreciation based on IRS Publication 946. If you would like the name of the asset, or General Asset Account (GAA) included in the title of the MACRS depreciation schedule, enter the name in this field. Enter the total cost to acquire the property (unadjusted basis). If the property is considered to be real property, be sure not to include the cost of any land that may have come with the property. If this property is used for both business and personal use, enter the percentage the property is used for business. If the property is only used for business, enter 100. Select the applicable number of cost recovery years based on the property's MACRS classification. Select the applicable depreciation method. For personal property the depreciation method is usually 200% declining balance. For real property (commercial or rental property) the straight-line method is usually required. For personal property the half-year convention is typically used -- except in cases where 40% of the total annual bases is placed in service the last quarter of the year, in which case you typically use the mid-quarter convention. The mid-month convention is typically used for real property. Select the month and enter the 4-digit year indicating when the property was first placed in service. Enter the 4-digit year you would like the calculator to calculate the depreciation expense for (must be a year that falls within the recovery period). This field is a required field, so if you are not interested in a specific year, just enter the year the asset was placed in service. If you will be printing out the depreciation schedule, indicate whether or not you want to round the currency amounts in the report to the nearest dollar. If you would like a depreciation schedule included in the results so you can print it out, move the slider to the "Yes" position. This is the unadjusted basis entered in the top section of the calculator multiplied by the percentage the property is used for business. Since the MACRS method fully depreciates all property, the salvage value is not considered in the calculations. This is the depreciation rate used by the calculator for the desired year. If the desired year is the first year, the percentage will be prorated based on the selected convention. If the desired year is the final year, the listed percentage may not apply when switching from declining balance to straight-line. This is the calculated depreciation expense for the desired year. If the desired year is the first year, the expense will be prorated based on the selected convention. The above results are for illustrative purposes only. Be sure to consult a qualified tax professional and/or IRS Publication 946 before completing your depreciation-related tax forms. Enter the name or description of the property if you would like it included in the depreciation schedule. Enter the total cost to acquire the property, not including the value of any land that came with it. Enter the percentage the property is used for business. Select the property's MACRS classification. Select the convention to use for the first year. Enter the month and year the property was placed into service. Enter the year you want to calculate the depreciation expense for. Choose your rounding preference for the depreciation schedule (if applicable). Indicate whether or not you want a printable depreciation schedule included in the results. 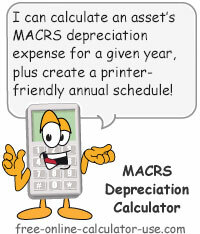 Click the "Calculate MACRS Depreciation" button and scroll down to see the results. What MACRS depreciation is and how to calculate it. MACRS is an acronym for the Modified Accelerated Cost Recovery System, which is the name given to the system created by the Internal Revenue Service to standardize the depreciation of property acquired for business use. Standardize? Maybe. Simplify? The total opposite. I'll be honest with you, in the days spent researching the formulas needed to create the MACRS calculator I couldn't help but be totally amazed at how a bureaucratic agency can take an otherwise simple expense formula and complicate it so thoroughly that it takes a 119-page document to explain it. Unbelievable! On most of my calculator pages, you will find that I attempt to cover all of the bases for those wanting to learn how to manually calculate the results the calculator was designed for. However, thanks to the IRS and their ruling factions, I'm sorry to report that the calculator on this page is an exception. In the case of this calculator, all I can offer is a summary of the parts of the publication that is applicable to the typical small business. If you own a farm, a speedway, an energy company, or any of the other 100+ non-typical types of businesses, and want to know exactly what your depreciation expense is, you may need to either hire a tax lawyer, or spend a week studying the Publication 946 -- depending on what type of business you are engaged in and on whether or not you have an infallible, photographic memory. In order to calculate MACRS depreciation, you will need to determine five different variables that make up the formula. I will try to summarize each as they relate to the typical business. The basis is the cost to acquire the property (price, sales tax, etc. ), less any land that was included in the acquisition cost, less the percentage the property will be used for personal use. Note that since MACRS fully depreciates property, salvage value is not used to adjust the basis. A property's classification determines which depreciation method you can use, as well as its allowable cost recovery period. At last count, Table B-1 in IRS publication 946 lists 13 different classes of property. However, before you can make a final decision as to your property's recovery period, you must first read through more than 120 different activity classifications listed in Table B-2 to see if the activity the property is used for overrides the recovery period as stated in Table B-1. While there are 9 different recovery periods (3, 5, 7, 10, 15, 20, 25, 27.5, and 39 years), most businesses property falls into the 5, 7, 27.5, or 39 year recovery period. The allowable recovery period for a specific property depends on which classification you decide it belongs in. Depending on what type of property you are depreciating, you may have the option of choosing either the declining balance method or the straight-line method. If you are depreciating real property you have no choice but to use the straight-line method. Furthermore, if using a declining balance method, at the point in the recovery period where it becomes more advantageous to use the straight-line method, the depreciation schedule switches to the straight-line method for the remainder of the recovery period. After all, if you never switched to the straight-line method you would never be able to fully depreciate the property. Mid-Month: Usually applies to real property. Regardless of what day of the month the property is placed in service, 1/2 month depreciation is added to the full in-service months to determine the prorated percentage. Mid-Quarter: If the mid-month convention does not apply, but 40% or more of your total annual depreciable property was placed in service in the last quarter of the year, this convention is used. Regardless of what day in a quarter the property is placed in service, 1/2 quarter depreciation is added to the full in-service quarters to determine the prorated percentage. Mid-Year: If neither the mid-month or the mid-quarter convention applies, this convention is used. In this case, no matter what date the property is placed in service, 1/2 year depreciation is used (50% of the full, 1-year depreciation expense). That is just a brief summary of the five variables that need to be determined in order to calculate depreciation using the MACRS method. Once you have solved for the 5 dependent variables, the next step in figuring a property's allowable depreciation expense is to use Charts 1-3 (Appendix A in IRS Publication 946) to determine which percentage table to refer to in order to look up the percentage needed for the applicable recovery year. Next, once you know which percentage table to use, you then find that table and cross-reference the recovery year (left-hand column) with the recovery period (top row). The table cell where the intersection of the cross-reference occurs will list the percentage figure needed to calculate the property's depreciation expense for the applicable tax year. Finally, you multiply the property's basis by the percentage figure to arrive at the property's depreciation expense for the year. To illustrate how to figure depreciation using the MACRS depreciation method and tables, suppose you purchased an office desk at a total cost of $800.00 and placed the desk in service on April 15th of 2010. Determine basis: You see in your records that the total cost to purchase the desk was $800.00 and you determine the desk is used 100% for business activity. Determine property class: Referring the Table B-1 in Appendix A of Pub 946, we see that a desk falls within the asset class 00.11 (Office Furniture, Fixtures, and Equipment), which lists a 7-year recovery period. Determine depreciation method: Since a desk is not real property, we can choose between the 200% declining balance method and the straight-line method. We will choose the 200% declining balance method since we want to recover the cost as quickly as possible. Determine convention: The desk is not real property so mid-month is not an option. You determine that the property placed in service in the last quarter of 2011 was less than 40% of the total for the year, therefore mid-quarter is not an option. This means the convention for the desk is the half-year convention. Determine appropriate percentage table: Referring to Chart 1 in Appendix A of Pub 946 we see that a 7-year property using the 200% method with a half-year convention points us to table A-1. Look up percentage: Referring to Table A-1 in Appendix A of Pub 946 we see that the intersection of Year #2 in the left-hand column and the 7-year recovery period in the heading row lists the percentage 24.49%. Multiply basis by percentage: Multiplying the $800.00 (desk basis) by .2449 (24.49%) tells us that our depreciation expense for the desk for the 2011 tax year is $196 (rounded to nearest dollar). Note that since the declining balance (DB) depreciation for the year 2014 ($71) would be less than or equal to the straight line (SL) depreciation ($71), straight-line depreciation is used for year 2014 as well as the remainder of the recovery period -- as indicated in the "M" (Method) column. Due to the complex and ever-changing nature of depreciation tax laws, please consider the results of the MACRS Depreciation Calculator to be for illustrative purposes only. In other words, be sure to consult a qualified tax professional and/or IRS Publication 946 before completing your depreciation-related tax forms.